Preheat oven to 200° C. Spray a baking sheet with non-stick cooking spray and add the sweet potatoes so that they are level and in a flat layer. Evenly drizzle with two tablespoons of olive oil, season with salt and pepper, and bake for about 45 minutes, or until soft and done. Halfway through baking, turn the sweet potatoes around so that both sides are cooked. Note: baking time will vary based on size of sweet potatoes; start checking at 30 minutes to see if they are soft. While the sweet potatoes bake, prepare and chop the remaining ingredients. To a large bowl, add the strained and rinsed black beans, and the chopped onions, red pepper, corn, parsley; set aside. To a large measuring cup or medium bowl, add the honey, Dijon mustard, lemon juice, 2 tablespoons of olive oil, salt and pepper to taste, optional is cayenne pepper, and mix; once properly combined set aside. 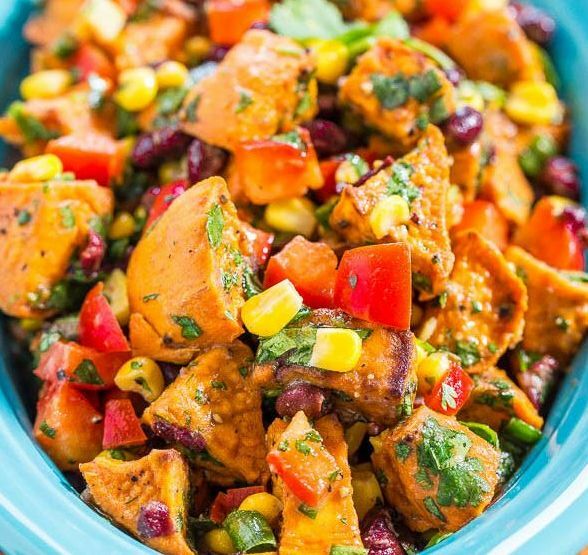 After the sweet potatoes are cooked, add them to the bowl with the beans and vegetables, add the sauce, and mix properly. Taste, to see if there is enough salt and pepper (or even if it needs a touch more honey, lemon juice, etc. ), tweak if it needs an adjustment and serve warm (although …it is also delicious at room temperature or cold).